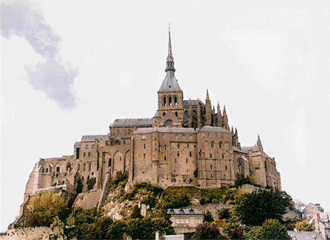 The Gothic-style Benedictine abbey which stands atop the Mont St Michel island is a major attraction. If one is asked to name the most visited tourist spot in France, the most spontaneous response is likely to be the Eiffel Tower. However, the most frequented tourist destination in France outside Paris is the Mont St. Michel where each year a whopping 32 lakh tourists go. Mont St. Michel is a small island located between Normandy and Brittany in France. It is separated by approximately one km of waves from the mainland at high tide. The main attraction is the abbey, which stands perched on top of the island. It is called the Wonder of the West. The island is about one km in diameter and about 80 metres high. At low tide, it is separated from the mainland by approximately one km of sand. Before a causeway was built in 1879, the only approach to the Mont was by foot over this land bridge. About twice a month, the tides come in very high. The difference between the highland and the low tides is 50 feet. It is said the tides come at a speed of 60 km/hr. However, the causeway connecting the island with the mainland always remains above the sea level. The abbey was built between the 11th and 16th centuries. It is a Gothic-style Benedictine abbey dedicated to arch angel St Michael. There are huge walls around the abbey and a village gradually developed around it. Since the island is constantly battered by powerful tides, its construction must have posed unimaginable difficulties. No wonder it is in the list of the Unesco World Heritage sites. There was a time when a visit to Mont St Michel was considered to be so dangerous that those planning a visit there were advised to write their will before beginning the journey. Every visitor has to pass through the Rue Principale, which literally means the main road. The name sounds somewhat inapt as this is the only street the town has. Besides the abbey, the other major tourist attraction is the omelette popularised by Mere Poulard meaning ‘Mother Poulard’. 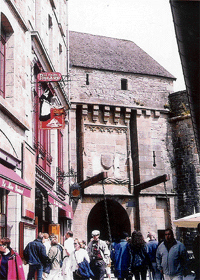 Annette Poulard came to Mont St. Michel as a young chambermaid for an architect. She married Victor Poulard, the son of a baker from the area, and together they took a small auberge (inn) on lease near the Mont St. Michel. Her omelettes soon became very popular. It is said she kept her recipes secret till her death. The business flourished and subsequently two hotels were added to the enterprise — Mere Poulard Hotel and Terrasses Poulard Hotel besides the historic Restaurant La Mere Poulard. The day I visited, it was around noon and there was a small crowd watching the process of preparation of an omelette outside La Mere Poulard. A boy was battering the eggs in a copper utensil — there must have been at least 30 eggs in it; having battered, the cook was now gently hitting the batter in such away that the utensil produced a pleasant, vibrating sound. The ritual here is to beat it rhythmically at least 42 times. Egg yolks are beaten separately and then seasoned with salt and pepper. The whites are beaten untill stiff. A tall young woman standing near the oven put the huge frying pan in front, then put a big blob of cream in it and reput it on the oven. Soon she took out the frying pan, the cream having fully melted away, and gently moved it in front of her co-cook. The cook poured a part of the batter in the frying pan which was then put on the slow wood fire. We all waited in silence. The young lady removed the frying pan from the fire and her companion rolled the material just once and the omelette was gently slid into a waiting plate. Finding it difficult to afford the price, I went to a nearby smaller restaurant recommended by the guide who had explained that after all an omelette is an omelette! While ordering an omelette, I did not forget the advice of the guide and requested for a small bottle of Calvados Cider. It was the best omelette I have had in my life. From food for the stomach to food for the mind. There are four museums in the town. All these are located close-by and for the price of tickets for two, one can visit all four. There is the Maritime Museum that boasts of more than 200 models of old ships. There is the Museum of History explaining the history of the place. In the third museum, called the Archeoscope, visitors are invited to discover the history of the abbey, its legends and stories. A sound and light show on Mont St. Michel is also put up. The fourth museum has an unusual name — Tiphaines House. We were told that this is the 14th century residence built by Bertrand Degueseline, the chief of the armies of the French king. He got it built in 1365 for his wife Tiphaine, who was an expert astrologer.